"Why do my brakes pull?" Are your “rotors” worn or warped? 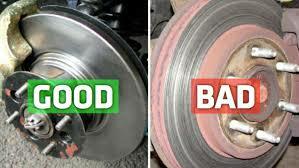 That can cause car to vibrate when you brake, sometimes it may even pull to one side. Do you from a visual inspection see and grease or oil present? Check both sides. Worn or warped rotors: Worn or warped rotors can cause the vehicle to vibrate when the brakes are applied and in some cases the car will pull to one side when braking. ... Collapsed brake hose: A brake hose that has collapsed can cause calipers to move unevenly, also causing the vehicle to pull to one side when braking. --How are the tires are they wearing evenly and what is the overall condition? --Are the tires inflated the same and to specifications. --What about the brake pads are they worn evenly? --The rubber brake hoses that connect to the calipers they should be inspected. Loaner cars, so you can back to your scheduled day.